EnStream has announced it has made progress towards bringing secure mobile credentials for mobile payments along with partnering with RIM and forming a new Mobile Advisory Council. EnStream’s technology will offer a secure credential solution for banks and credential management for wireless carriers. The company recently partnered with SaskTel in September to offer its Secure Element Management (SEM) system, which provides real-time wireless management of credentials within smartphones. The initial agreement between EnStream and MTS gives MTS access to EnStream’s Secure Element Management (SEM) platform, and in turn, EnStream will provide participating banks and other financial institutions the means to facilitate transactions for MTS customers. These customers will be able to make payments using Near Field Communication (NFC) technology, which allows one device to send and receive information with another device in close proximity. MTS customers will be able to tap their NFC-enabled smartphone to a payment terminal to make payments without the need for chip cards. The agreement looks to broaden the usage of NFC for mobile payments. Back in April, it was reported that Rogers, Telus and Bell would be set to launch EnStream’s mobile wallet within six months time. EnStream has an existing mobile payment app called Zoompass, which allows money transfers via Interact, Western Union and prepaid Zoompass MasterCard. 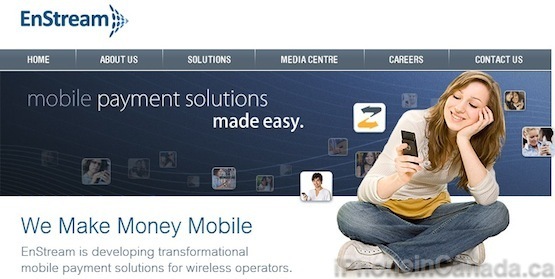 Rogers recently partnered with Gemalto to offer SIM-based NFC mobile payments.